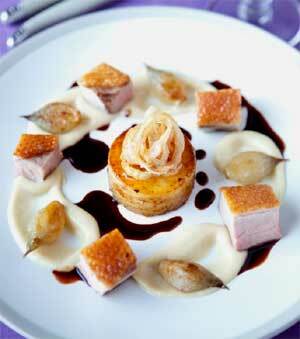 This recipe for Breast of Gressingham Duck with Shallots Three Ways comes from www.UKshallot.com. The shallot puree can be made days in advance or even made and frozen then used as you need it. Place the butter into a suitable pan. Add the chopped shallots and cook gently until they are ready to puree. Place into a food processor and puree finely, pass through a sieve if required. Peel the potatoes and slice the sides off to flatten them. Then cut into discs using a cylinder or pastry cutter. In a saucepan melt a knob of butter over a moderate heat and put in the potatoes. Cook on all sides until golden. Then place the potatoes in an ovenproof dish and half cover in chicken stock. Place in the oven at 180°C for 35 to 40 minutes. After 15 minutes add three-quarters of the peeled shallots. Place a suitably large ovenproof pan on the stove and pour in a spoonful of oil. You wont need much as the duck will render down an awful lot of its own fat. Season the duck breasts with sea salt and pepper and place flesh side down into the hot pan. Cook for 1 minute then turn them over onto the fat side and place the whole pan with the duck in it into the oven. They should take approximately 10 minutes to cook depending on their thickness in an oven at 180°C. Once cooked remove from the oven and allow to rest in a warm place for 6 to 8 minutes. Deglaze the duck cooking pan by placing back on the heat, pouring in the red wine and reducing until syrupy. Add the remainder of the stock and reduce until you have reached a sauce consistency. Slice the shallots into thin rings and place into a little seasoned flour. Deep fry in hot oil until golden brown and then place on to kitchen paper to drain. Cut the duck breasts into six equal cubes and place that around the outside and drizzle with the hot sauce and serve immediately.